No matter where you bought your cam, let us safely break it in! 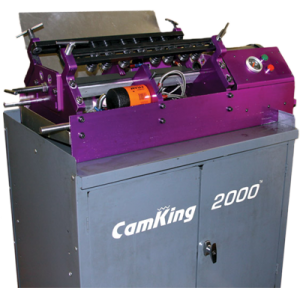 The Cam King was produced and patented by Cam Research in 1996. It’s the most reliable method for breaking-in today’s aggressive flat tappet camshafts outside of the motor! You know the routine – assemble the heads with lightweight valve springs. Prime the carb and pre-set the ignition timing. Pray that she fires the first time and get the RPM’s up. Keep an eye on the water temperature and listen for any unusual noise. 20 eardrum-splitting minutes later you breathe a sigh of relief; everything’s okay. The engine sounds great, and you’re glad you took the time to break-in the camshaft the right way. But, now comes the drudgery of installing the racing valve springs. “Yeah, I can do it in an hour,” you brag. A few burnt fingers and a couple of gouged knuckles later and the job’s still not finished. There’s a better way – the patented CamKing. 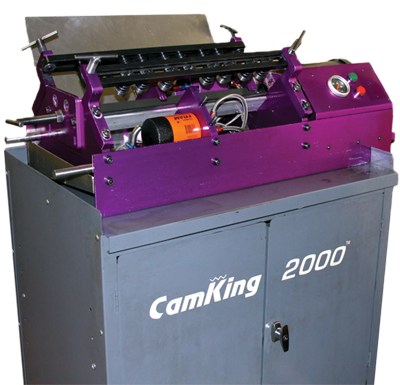 The CamKing does the work for you, providing a full 30 minutes of steady 2,000 RPMs to your flat tappet cam. The cam is completely submerged in oil during the process. The spring pressure starts out low and gradually increases to full spring pressure during the break-in period. When complete, the lifters are numbered and the kit is shipped to your door. All that is left to do is lube and drop them in. They’re ready to fire and you’re off the hook! Best of all, you DO NOT need to have a Cam Research cam. We will brake in Ford camshafts from any manufacturer!